Having lived in Possum Valley for 42 years now and I can say, without undue modesty, that I am expert in the art of possum wrangling. It is an arcane skill which, alas, has little commercial value in the wider world’s job market. Indeed, it is a skill few of you will have occasion to use. Perhaps some future guest will recall my words of wisdom when dealing with a kitchen invasion. Please bare with me, oops Freudian slip, please bear with me, as every man likes to boast of his achievements. However slight. 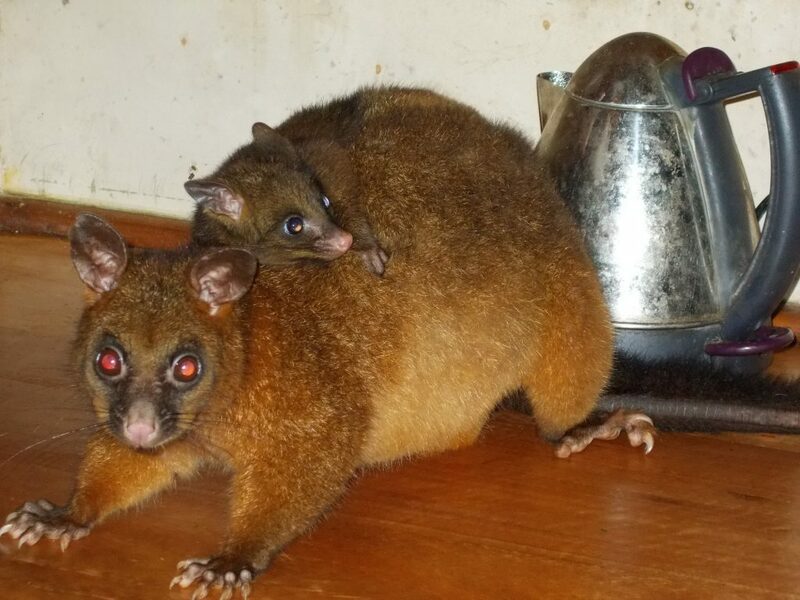 First thing to realise is that possums are not basically carnivorous in that they don’t hunt other animals. They certainly will eat meat raw of preferably cooked and possibly will kill and devour wounded or dead animals. As will many animals when the opportunity arises. A few days ago I heard a thud as a bird flew into a window. Probably a pigeon I thought as they are heavy birds which fly fast. It was perhaps 30 seconds as I followed the sound and saw the grease smear on the window and a stunned brown pigeon on the ground with its wings spread. I recognise that as a defensive posture. 10 seconds later a currawong landed a meter away and the pigeon turned to face it. To no avail as the currawong leapt upon it and grabbed it by the neck with a claw and dispatched it very quickly by smashing the pigeon’s head in with its powerful beak. After plucking some feathers for a while it tried to fly off with it but only got 10m. Meanwhile back at the possums, the best wrangling equipment is welding gloves. They are thick leather gloves that come up to the elbow so the claws and teeth of the possum can’t hurt you much. Can also be used for welding and doing stupid things with hot fires. Grab the possum round the neck and by the tail and you can do what you like with them, though you wont be friends for life. For more advanced students, simply pick them up by the tail with your hand. You will have to hold them at arms length or they will rip your shirt off and very likely large chunks of flesh as well. A few will hang in a docile fashion but 95% will twist up and shred your hands and forearms within a few seconds. You can avoid being flayed by vigourously shaking your arm from side to side as you walk out of the house to the disposal area. I did say it was the advanced students course. For beginners perhaps the most effective method is to shoo them out. For this to work smoothly, without excitement, accidental injury or massive loss of crockery, you have to plan a safe and easy exit route for the possum. Preferably the way they came in as they are not too bright and can’t see very well in bright light. I suspect the clearest trail is by scent back along the the urine they deposited on the way in to declare their ownership of your kitchen. This is easily spotted as a dark yellow sticky zigzag trail that never dries and stinks forever. Approach slowly at 90 degrees to the escape path as what you have to do is keep the possum calm, but increase the proximity threat. If you get to within 1m and it shows no signs of moving, perhaps a reappraisal is required. You have one truculent possum. A strategic withdrawal may be advised to go and watch the tele or make a cut of tea. In this picture a couple of days ago, the latter alternative was not available. You will notice the poised posture and the impressive array of sharp claws. I did. So I went for another half hour of essential television viewing whereupon I found that the possum(s) had exhausted my resources and left. I prefer to call it the diplomatic solution rather than abject capitulation, but hey! it worked. This hardworking mom also had a distinct bulge in the belly which suggested another one in the pouch. This is a coppery brushtail possum, the most common and boldest possum at possum valley. The coppery brushtail is a subspecies of the grey brushtail, but only found in the rainforest. Flannery suggests that its genetic relationship to the grey needs to be clarified, but I have found that the possum itself is in no doubt of its status. In the last few days the dire forebodings I suggested in my previous post “Heat Wave”, seems to have been fulfilled. Temperature records tumble sometimes only lasting a day. Meanwhile, a two year exhaustive report by hundreds of scientists from many US government agencies in the US predicting dire consequences of global warming has been dismissed by Trump with “I don’t believe it”. Ever prepared to back his ‘intuition’ against a few hundred scientists with a lifetime of study, he will go down in history as a villain to rival or excel Hitler or Genghis Khan. I suppose Atilla the Hun should get a mention and perhaps Vlad the Impaler. Though Vlad could at least claim he was successful in turning back home the Turkish forces in disgust. Rather like Australia’s refugee offshore processing policy really.